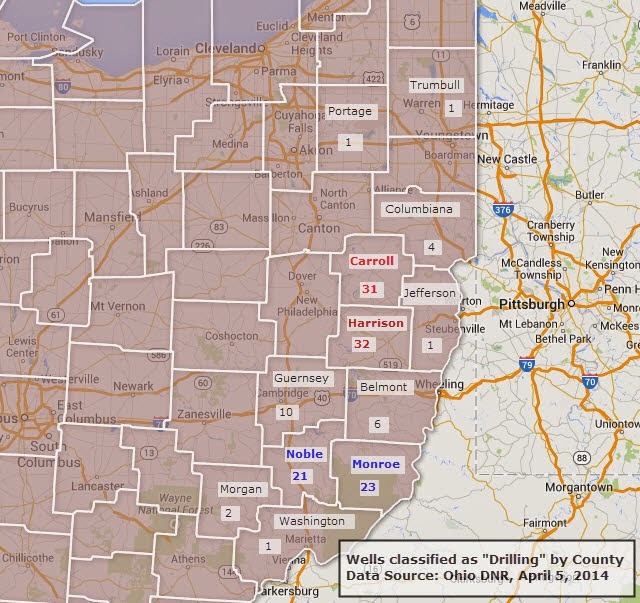 The April 5th 2014 update from the Ohio DNR shows 133 wells drilling in the Utica/Point Pleasant in Ohio. The map below shows drilling activity by county. According to Ohio State geologist Mike McCormac, the higher activity corresponds to the "wet gas" window, with dry gas to the east and a mostly unexplored oil window to the west. And with a reported cost of 8-10 million dollars to drill each well, this activity equates to a big "bet" by the oil and gas operators on where they expect to get the best returns. This also indicates a level of de risking and confidence in return on investment. Many believe that we are in the early days so we should expect some cautious exploratory wells to appear away from this core area but there is a lot left to exploit in these core counties.